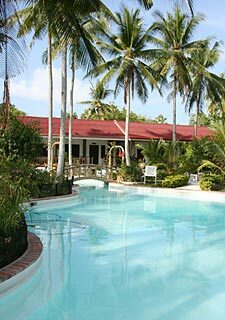 Polaris Dive Center and Resort is located on the small Island of Cabilao, near Lighthouse point, at a nice beach facing Cebu island. The rooms face a nicely designed garden with a large swimming pool. 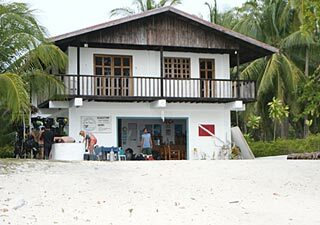 The resort includes a good restaurant, and is connected with a fully equipped dive center. The resort is run by the German-Filipino couple Franz and Maria Baumann. At the same time, Franz is also the manager and dive master of Polaris Dive Center, and takes an active role in protecting the environment around Cabilao Island. Given the fact that literally everything (including fresh water for showers during the dry season, and all building materials) has to be brought to the island with banca's, the prices here are very reasonable, at about USD 32 per night for an air-conditioned room with hot shower.